Basically you install a tiny agent in your PC or phone, which silently waits for a remote signal to wake up and work its magic. Besides gathering information, you can also trigger actions remotely such as sounding a loud alarm or showing a message which will appear onscreen – just in case you want the guy to know he's being chased at. There's two ways in which you can send Prey the activation signal and get the reports. Recommended for most users. You monitor your devices on Prey's web Control Panel, where you can watch new reports arrive and manage specific settings, such as changing the frequency for reports and actions. You can add up to three devices for free, and can optionally upgrade to a Pro Account in case you wish to bypass this limit. For advanced users who wish more control. In this case, reports fly directly to your inbox but you need to set up your SMTP settings, and more importantly, you must generate a valid web URL which will trigger Prey to wake up when deleted -- otherwise Prey will keep sending reports on each interval! (For more information please check our FAQ). 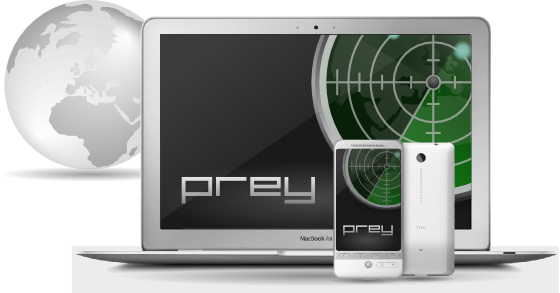 Prey uses either the device's GPS or the nearest WiFi hotspots to triangulate and grab a fix on its location. It's shockingly accurate. Prey has very few dependencies and doesn't even leave a memory footprint until activated. We care as much as you do. Take a picture of the thief with your laptop's webcam so you know what he looks like and where he's hiding. Powerful evidence. Grab a screenshot of the active session -- if you're lucky you may catch the guy logged into his email or Facebook account! Fully lock down your PC, making it unusable unless a specific password is entered. The guy won't be able to do a thing! Get a complete list of your PC's CPU, motherboard, RAM, and BIOS information. Works great when used with Active Mode. Prey can check its current version and automagically fetch and update itself, so you don't need to manually reinstall each time.